Home Entertainment Obama Finally Slider Obama Finally Met "Little Miss Flint, "It Was Beyond Adorable"
Obama Finally Met "Little Miss Flint, "It Was Beyond Adorable"
In the note, Mari explained: "I am one of the children that is effected by this water, and I've been doing my best to march in protest and to speak out for all the kids that live here in Flint." While she didn't meet the president in DC, Obama took her request one step further and responded that he would come to Flint. 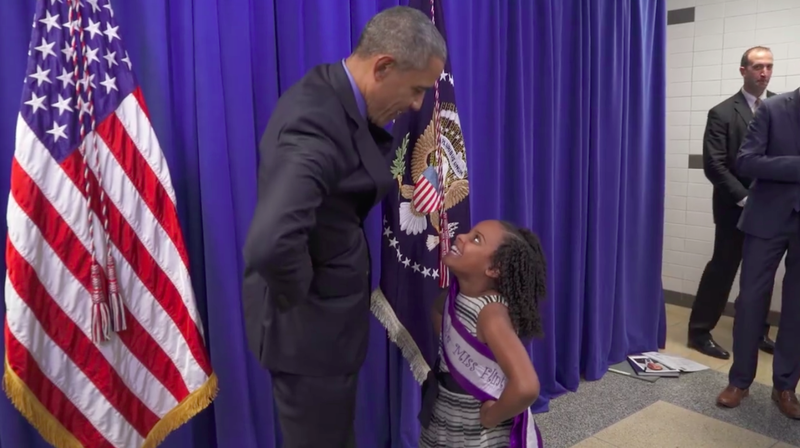 Obama addressed the water crises in Flint yesterday, and he also met Mari. In a video posted by the white house to Instagram, we witness Mari finally meeting Obama. As we watched her jump, while giggling, into Obama's arms, the moment became a sliver of hope amid this environmental tragedy.